Read a piece by Cynthia Cruz on the influences behind How the End Begins for Blunderbuss Magazine. How the End Begins was named one of the best poetry collections of 2016 by Fourth & Sycamore and was a finalist for the 2016 Foreword INDIES. How the End Begins is about the world’s seductions, its incessant clamoring for more which is juxtaposed against the invisible world: the quiet, the call of the desert, and the pull to faith. The book chronicles this move toward faith and away from the “dingen” (things or stuff). How the End Begins is a burning down, a kind of end of the world while, at the same time, a new, triumphant beginning. "In her fourth collection, Cruz (Wunderkammer) continues to deliver surprises with lyric poems that are deceptively sparse yet dense with texture and meaning...." - Publishers Weekly, March 2016 Read the full review. "...Cruz is a poet here obsessed with the wounds and wonders of childhood, and she nests both within a floating snowglobe of synth music and feathered morbidity. The collection co-opts the imagery of fairy tales and dreams to lull the reader into its world of tortured, titillated reverie...." — Fourth & Sycamore Read the full review. "...Each poem links up—in tone, in cadence, in metaphor—with its antecedent(s). Indeed, it’s hard to suggest reading any but a few of the poems on their own (or, perhaps, hard to imagine them being as effective as they are here). As it is, the narrative is a weaving of dreams and visions, drugs, madness, the ups and downs, days of light and of darkness, of a depressive, or of a madwoman...."— The Rumpus Read the full review. "Cruz’s penchant for evoking the ethereal and haunted without sinking into melodrama and camp is dazzling; the weight of these poems rests on the thinnest transparent ice, but they don’t fall through." — Fourth & Sycamore Read the full review. "...To experience this feminist imagination is to step 'inside the warm lung of the chronic,' where the reader breathes in the 'beautiful toxin' of each inevitable word. "— SCOUT Read the full review. 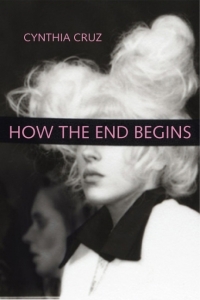 "With its emphasis on slow catastrophe, eschatological crisis, and damaged dream worlds, How The End Begins is a significant addition to Cynthia Cruz’s distinctive canon. "— The Kenyon Review Read the full review. "The reader must stumble in the fog of Cruz’s mischievous hallucinations. It’s a pleasure. "— LitHub's 30 Poets You Should Be Reading Read the full review. "These poems are both fierce and delicate, they own each of these words outside of their various connotations; instead of Jean-Paul Sartre’s paper knife and Adrienne Rich’s glass pen we find in Cynthia Cruz’s collection a glass knife glittering with its ability to pierce the heart. "— Fork & Page Read the full review.